Our working sheep farm is nestled in the heart of the scenic Cape Overberg with beautiful views over the valley. 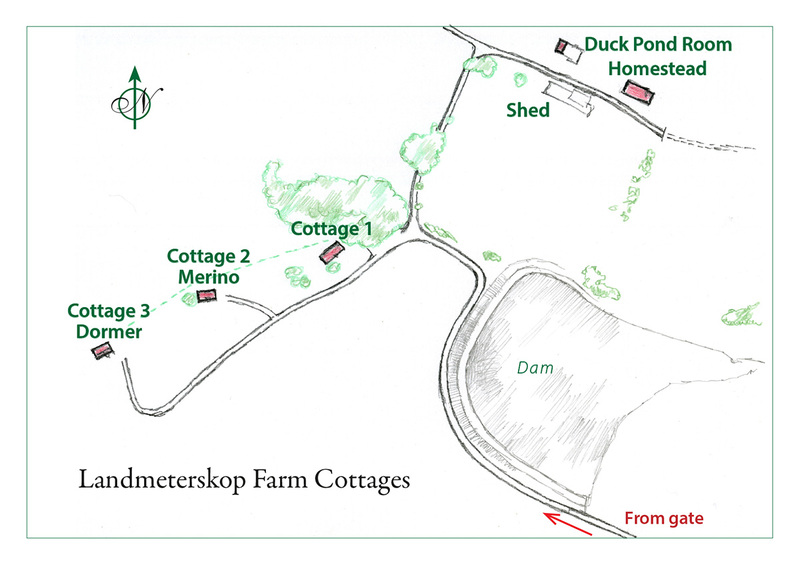 A perennial creek meanders through the farm; and a farm trail winds through meadows where sheep graze, along farm dams where guests may swim or picnic, all the way up a fynbos covered mountain. Landmeterskop is the ideal getaway if one needs time away from the persistent demands of city and work life. It is also the perfect place for artists, writers or scholars who need peace and tranquility. Stay in one of our tastefully decorated cottages. All of them have large verandahs where one could braai or eat, sit and relax or dream while enjoying the beautiful views over the valley. You also have your own fenced front garden where you can sit and enjoy the views or gaze at the stars after dark.